You've seen the articles, watched events like Crankworx and Red Bull Rampage, and even scoured Craigslist until 4 AM looking for a bike, but now you're ready to have a go at downhill mountain biking. We'll walk you through how to do it like a champ so you can walk away and live to ride another day. 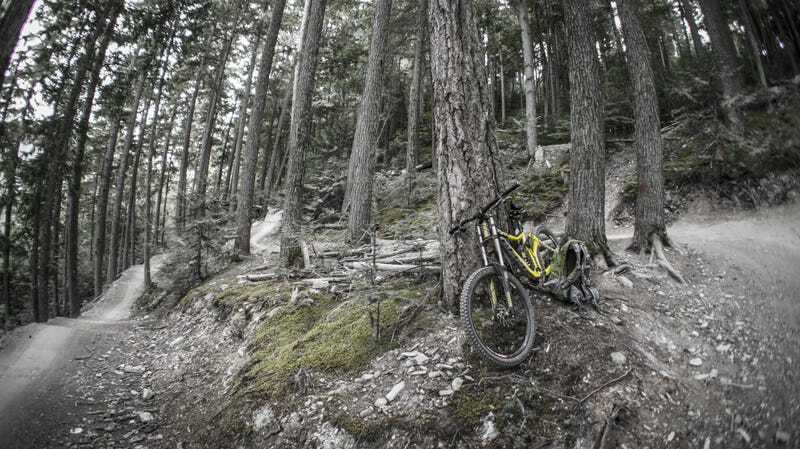 Of all lift served mountain bike parks in the world, Whistler is known as the world's greatest with more than 75 trails and over 50 miles of lift served gravity only routes. Want to learn how to downhill mountain bike? Don't want to invest $5,000 in a bike just yet? Do you enjoy the friendly hospitality and wonderful après of the Canadians? Whistler is the place to be and is packed full of adventure! As an avid cross country mountain biker, I am no where near noob status when it comes to bike handling skills, but that doesn't mean that the idea of mounting a bicycle that cost more than my motorcycle and careening down the side of a mountain, that is usually reserved for skiing, didn't scare me a little. I have always wanted to progress my skills and came to the conclusion that the best way to do so would be to take the bull by the horns, approach my fears head on, buckle down, mount the horse, or in this case the bike...you get the idea. The Mountain Bike park at Whistler Blackcomb in British Columbia is far and above the greatest place for lift served downhill mountain biking in the world. That's a tall claim when there are places in the US that offer similar services, but Whistler stands out with a strong heritage of excellence. Every year in August they host the Crankworx event which draws in the world's top athletes to compete in a sport of who can get down the mountain the fastest with out crashing. But would a place like this be suited for a first timer? The answer is YES! The mountain is perfectly set up for riders of all ages and skill levels, including beginners. You can literally ghost ride your bike from the rental shop to the lift line, meaning that you do not have to worry about bringing your own gear. And you won't be stuck hanging on to your sister's Huffy either, these guys know that they have a world class resort and the equipment is on par. For about $175 per day, you can get a lift pass and a Giant Glory 1, that the on mountain rental shop is stocked full of. You can pick up the rest of the protective gear that you will need to protect your noggin and your skin in case of spill, and let's face it, you are riding a bike down a mountain, you are bound to crash. It will behoove you now to protect as much of your body as you can so you can keep on keepin on. A full face helmet, elbow/ fore arm, knee/ shin guards, DH specific shoes, and even gloves are all included with your rental. I have been riding bikes for a while and took it slow, thankfully I was able to keep the rubber side down. For summer, every other lift chair that is usually used for skiing has been replaced with a rack that holds up to 4 bikes. You simply walk your bike in to it's little holder as the lift comes around, wait for the next chair, then scout your next line and enjoy the ride up. I made friends with Stephen from North Carolina, he too knows where the best place to ride is. Once at the top, the helpful mountain hands will have your bike waiting for you, and now you are just about ready to go! Before taking off straight in to the runs, you need to get accustomed to the bike, and know the rules of the mountain. High performance bikes have hydraulic disc brakes that could probably stop a train, but still hold the modulation of your good ole v-brakes, with out the death grip required to lock them up. At the top of the Fitzsimmons Chair, the trail crew has set up a perfectly suited Skills Centre. Here you can find small examples that you can expect to find on the rest of the mountain. It's a great spot to warm up and make sure the bike is all set. Run through the gears, get a feel for the brakes, then navigate around the fun little obstacles. With 8" of suspension travel you can roll over just about anything! Know the rules and follow them. Just like skiing, the mountain is laid out and with an extensive trail system with varying difficulty. A green circle is the easiest of all and does not require much balls to get done, there was a 6 year old behind me. The blue square runs are the intermediate and start to incorporate jumps and man made features. On all blue runs, the jumps are table tops, that allow you to go slow and not worry about falling in a gap between take off and landing. As you work up to the black diamond, things get crazy. Gap jumps, super technical sections, and much larger features are the norm here. After warming up, you are ready for the first lap! This one is an easy one on an appropriately named trail, Easy Does It. Again, this is a great time to get familiar with the 40 pounds of bike underneath you and not worry about going to fast. Look out ahead and keep an eye out for other riders. Riders down hill of you have the right of way, and it is your responsibility to not run in to them. If someone does come up behind you, simply pull over to the side of the trail and let them pass. All of the riders that I encountered were friendly and not too worried about being a jerk. Enjoy the berms, the rolly bumps, and the fact that you are riding miles on a bike and not having to pedal! Gravity is great! The trail crew has really invested their time here. The people working here are the same people that will be riding the park all day when they aren't working. It is evident in how well groomed the trails are and how inventive some of the features are. Through out the mountain, you can expect to find wide smooth flowy easy trials, technical single track, bridges, jumps, wall rides, and a plethora of other awesome features to keep you going all day (or all week!). When I visited, Crankworx had rolled through only 2 weeks prior. Evidence of the madness was still on course with jumps twice as tall as me, houses with ramps on top of them, and features that you might only expect to work in a game of line rider. While I only ventured in to the Fitzsimmons zone, less than 1/3 of the mountain, Whistler has 2 other zones with more terrain. The Garbanzo zone is the middle of the mountain and is loaded with more intermediate and difficult trails, while the peak of the mountain is limited to advanced riding only. In my quick day there, I was able to do about a lap every 30 minutes, plan for more if you haven't been on a bike in a while. Private lessons are available and would be suited for those that are seriously new, anyone can do this! The shirt on your back and pants you are wearing will do just fine. The rental shop is loaded with all the gear you could ever need to enjoy a day (or week) on the mountain. A little bit of cash for the bike rental, food, and beer and you are all set. My wife and I were celebrating our 2 year anniversary with a road trip through the Pacific North West, or our Vancouversary as we started calling it (the sequel to our Cancuniversary from last year). We flew to Seattle because the flights were way cheaper than international flights. We then rented a car in downtown Seattle because it was half the price, even after a $40 taxi ride, we then ventured north. We stopped in Vancouver for a tandem bike tour of Stanley park and Granville Island, Whistler for the downhill, Vancouver island for the seclusion, and ultimately back to Seattle. If going to Canada (or Mexico), make sure your passport is current and please please please get a US Passport Card. It is $15 extra and is good only for land and sea travel between US and Canada, but it is accepted in expedited lines that make coming home much quicker. Gas in Canada is somewhere around $5/ gallon but measured in pennies per liter (very confusing at first). Also, with the current Canadian dollar to US dollar exchange rate of $1.00 CAD = $0.92 USD, you are getting an 8% discount on everything! Pay in local currency, no one likes going to the money changer. Make sure to stay in the Whistler Village. There are ton's of hotels in the near proximity and using your car will not be necessary. The Village is stocked with shops, pubs, swanky restaurants and stuff to suit the whole family. While visiting, my wife and I stayed at the Sundial Boutique Hotel. From the comfort of the hot tub on our balcony, we could watch people coming down the mountain and spy on the rest of the guests in the village (this would be awesome in winter!!). For après (or "after ski" as the Canadians call it), you have to eat at Araxi. While it is very fancy, the food isn't too expensive. The chef sources most of the food from local farms in the area and creates amazing dishes. We were treated to foi gras, or duck liver pâté, something illegal in California for reasons beyond me, because it's delicious! Whistler Blackcomb is actually 2 mountains connected by a world record setting Peak 2 Peak gondola, you can still get to each mountain at the base, but the Gondola is way cooler. Spanning almost 2 miles, the gondola travels from Whistler peak over to Blackcomb peak in 11 minutes. Of the 28 cars that run round and round, 2 are painted silver and have glass bottom floors! It is worth the wait to get on these cars for the extra bird's eye view. At it's pinnacle, atop Fitzsimmons creek, the Gondola is 1,430 feet up. Don't worry about it failing, the Austrian engineers did their homework and this thing can shrug off 50 mph winds with out a problem. We were greeted with a typical Pacific North West drizzle and clouds that made us feel like we were floating towards heaven! Stay longer! With only a single whole day in Whistler, we were left scrambling trying to fit everything in. Come for a while, stay for a while. Food is pretty pricy in all of the restaurants, stop by the grocery store in the village and save a few dollars on meals to spend on adventures. Can't wait to head back once the snow starts falling and report on the deep powder stashes!